10. There is an abandoned waterpark on Disney property. Guests that are newer to Walt Disney World may not remember River Country. River Country opened in 1976 and then permanently closed in 2001. There were challenges with operating this park as the park did utilize water directly from Bay Lake for some of the attractions. Florida lakes have been known to have bacteria issues, which is a health and risk concern for Disney to allow guests to expose themselves to the water. The theme for the park was one that incorporated the theming from the nearby Fort Wilderness and Wilderness Lodge with a very rustic, outdoorsy type of feel. The park used to be extremely popular, but with the opening of Typhoon Lagoon, it made River Country look older and more dated, even if there weren’t other risks and issues that Disney faced with the park. Even more mysteriously, the water park wasn’t demolished, it was left to deteriorate and the current state of the park is a site that is grown up with weeds, trees and wildlife with water slides and buildings lost in the thick of it. Guests have broken in to the park and taken video to put on YouTube, but we don’t recommend trying to explore for yourself since it would result in getting banned from Walt Disney World if you are caught. GREAT NEWS however! Disney has now released information that they will be opening a new Disney Resort in this location that is scheduled to open in 2022. It will be a Disney Vacation Club Resort with 900 beds. Can’t wait to see this one unfold! 9. You used to be able to swim with the sharks! The Shark Reef located at Typhoon Lagoon closed fall of 2016 to our disappointment. Guests visiting the Shark Reef had the opportunity to grab a snorkel and goggles and swim across the man-made reef and get a good look at sharks and other tropical wildlife. We are bummed this one of a kind experience is closed. 8. Blizzard Beach is the largest of the water parks. If you are having trouble making a decision as to which theme park to visit, you could possibly make that decision based on the size of the park. If you want a bit smaller park with a little less walking, then you may opt for Typhoon Lagoon. If you want to go big, then go for Blizzard Beach. Blizzard Beach makes up a total of 66 acres. Typhoon Lagoon makes up a total of 56 acres, so 10 total acres difference, which is a decent amount of land difference. 7. Crush ‘n’ Gusher packs a lot of water. Crush ‘n’ Gusher is the water coaster-like attraction at Typhoon Lagoon. There are 3 different slides that are each a different experience. You can ride down them either in pairs or as a single rider. The names of the slides are the Pineapple Plunger, Coconut Crusher and Banana Blaster. The slides are each propelled with water and mechanics to keep the slide moving quickly throughout the tunnels for an amazing ride. That water is extremely powerful and it takes a lot of water to for one ride to be completed. So much water in fact that it would take an average home swimming pool to catch all of the water from just ONE slide! Crazy, right? That is a lot of water moving through the slide in around 1 minute! 6. You can take surfing lessons or have surfing parties. If you have always wanted to learn to surf, then this is another area where Disney magic can help you realize a dream. The wave pool at Typhoon Lagoon emits a perfect wave every 90 seconds or so, which is perfect for learning to surf. There are lessons available on select days before the park opens where they will teach you safety, how to stand on the board and how to catch a wave. If you already know how to surf and/or have a group of surfers, you can book a surfing party so that you get the wave pool to yourself to surf, since there is no surfing once the park is open. 5. Guests love the water parks! No matter which of the two water parks are your favorite, many guests out there will agree with you. Guests have their own preferences and boy do they love the water parks. Each water park hosts over 2,000,000 guests annually! That is an average of 5,500 guests per day (although it will be more crowded than this in summer months and likely less than this during the winter months). That is definitely a lot of guests to spread throughout the entire park, which is why we are glad that there are so many great things to do! 4. Summit Plummet holds a couple of records. If you are looking for one of the extreme water thrills, then head over to Blizzard Beach. There you will find Summit Plummet. What makes it so special? Well, this slide is the tallest and the fastest slide in the country! The slide is 120 feet tall, which is around 12 stories! When you slide down this almost vertical drop, you reach speeds around 55mph! Can you imagine your own body moving through a slide that fast? 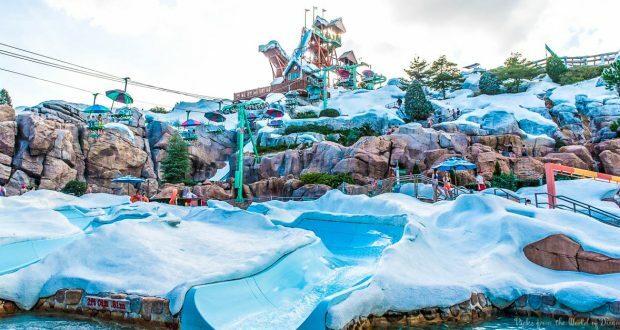 The slide with a similar design at Typhoon Lagoon, Humunga Kowabunga, is only half the size of Summit Plummet at around 60 feet tall. Think you have what it takes to give it a try? 3. Go cabana for a deluxe experience. Many guests don’t realize that you can get a deluxe experience at either of the water parks, but it does come with a deluxe price tag. You can rent a cabana that accommodates 6 people for around $350 during peak season and around $250 during off-season months. The cabana comes with waters in a cooler, towels (normally you have to bring your own or pay a towel rental fee), refillable drink mugs for each guest and comfortable seating under the protected covering of the cabana. You also get an attendant that will take your food and snack orders and bring them to the cabana so that you don’t have to wait in line, which is very helpful. If this is too pricy for you, you can also look at just renting and umbrella and chairs so that you have a reserved, covered spot to rest in between all the fun.